Businesses are required by law to have certain policies in the workplace, Health & Safety being a topical example. It is also good practice (and common practice) to have policies in place for a myriad of other issues, and a very common example is Information Technology. A businesses Information Communication and Technology (ICT) Policy defines the permitted practices of workers within the workplace with respect to telecommunications, computers, mobile data devices, software, social media and intellectual property. Having a solid ICT Policy defines the rules for staff, removes misunderstandings and provides the Employer with the protection needed should abuse of the business information systems occur. Our policy provides 18 basic clauses to cover the most common issues in the modern workplace. Issued covered are; file sharing, copying, uploading, downloading and copyright licence breaches. Social website usage and rules, password protection issues, unauthorised and inappropriate electronic content, software installation and uninstallations. Personal use and mobile storage devices. Mobile phones and personal usage. 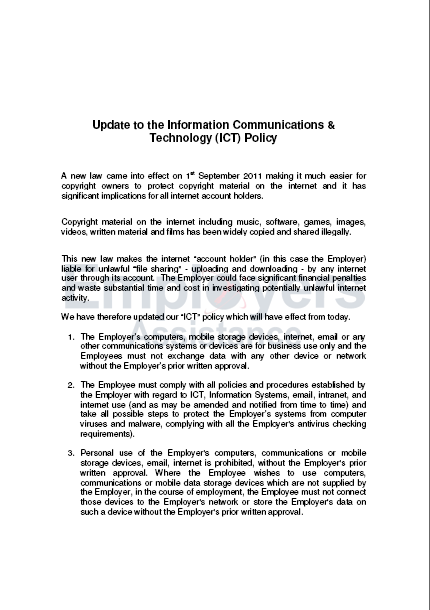 Buy our ICT Policy template online now and take the steps necessary to protect the company from bad workplace technology practices. "..Without doubt a great service and at times a lifeline to providing answers to staff. We wish you well as the law becomes more and more challenging..."